I am trying to track down the name of a film or TV show I saw as a child during the 70s, probably during a "Creature Feature" type TV rebroadcast. I believe the work was actually from the 50s or 60s (black and white, as I recall). As I recall, there was some kind of crew of protagonists on a river-boat hunting for a Gill-Man/Creature From The Black Lagoon type of monster. I also have a vague recollection that some of the protagonists/boat's crew vanish as the monster surreptitiously attacks across the film. I have the impression that a (probably "the," and probably did a lot of screaming) sympathetic female character on the boat is kidnapped and the climax of the film reveals that the disappeared people have been/are being transformed in something like a surgical theater into piscene amphibious humanoids just like the primary antagonist. The Doctor Who story "The Underwater Menace" (1967)? The Doctor, with Polly, Ben and Jamie in tow, lands the TARDIS on a volcanic island where they are captured and taken into a cave complex. It soon becomes clear that this tiny island is all that remains of the ancient Atlantean civilisation. Mad scientist Professor Zaroff has convinced the Atlanteans that he can raise the city from the sea, but in reality he plans to drain the ocean into the Earth's core and thereby destroy the planet. Fun Fact: The story spans four episodes, but only two of the four survive today. The other two remain missing. Also there's Isle of the Fishmen, with a very similar plot (minus the Doctor) but it's from 1979 and apparently not B&W. 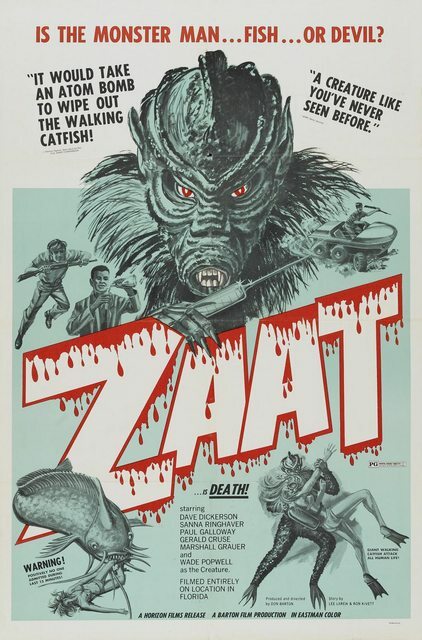 Perhaps Zaat (also known as The Blood Waters of Dr. Z) 1971? The film begins with Nazi mad scientist Dr. Kurt Leopold in his lab, where he has lived alone for about 20 years. His formula (the titular Zaat) can turn a man into a walking catfish. He injects himself with the serum and emerges from a tank as a giant fish-like creature. Leopold decides to kill the colleagues that laughed at his work. He begins with a character named Maxson. In a lake where Maxson is fishing, Leopold swims under Maxson's boat, overturns it, and proceeds to kill Maxson and Maxson's son. Maxson's wife escapes, although she is in shock from the attack. After killing Maxson, Leopold discovers a girl who is camping out alone on the shore of the lake. Leopold rlater eturns to the lake where the girl is still camping and waits for an opportunity to abduct her. Lopold catches her underwater. He swims with her to his lab, even as she struggles in vain to escape. Leopold injects Zaat into her neck. As she is immersed into a tank of Zaat, the girl wakes up and struggles against the ropes holding her. The equipment malfunctions for reasons unknown, and her corpse, partially transformed, is pulled from the tank. Leopold attempts to kidnap another mate. His choice is Martha Walsh, the lovely female member of the INPIT scientific team sent to investigate the weird happenings in the town (caused by Dr. Leopold). Leopold grabs her after her male counterparts leave her alone. Leopold takes her to his lab, but two of her companions (having unraveled the plot) are waiting there. Leopold kills them (including the sheriff) violently. He injects her with Zaat, readies her to be dunked into the tank, and makes his getaway, with canisters of Zaat. Martha's transformation does not go as planned and she gets saved from getting dunked in the tank by one of her dying male companions as Leopold flees toward the ocean. Despite being saved from the transformation, she appears to be in a trance and immediately follows Leopold into the sea. The movie ends ambiguously, with Leopold seen shot but not killed. It has one leading female and she does do a lot of screaming. It takes place on a submarine, not a river boat, but it involves men being turned surgically into 'gill men'. Here is the full movie from Youtube . The surgical scenes start at about 30 minutes, and soon after you can see what you referred to as a 'surgical theater'. P.S. It's in color, though, not B & W, but maybe you watched on a B & W Tv? Not the answer you're looking for? Browse other questions tagged movie tv story-identification or ask your own question.